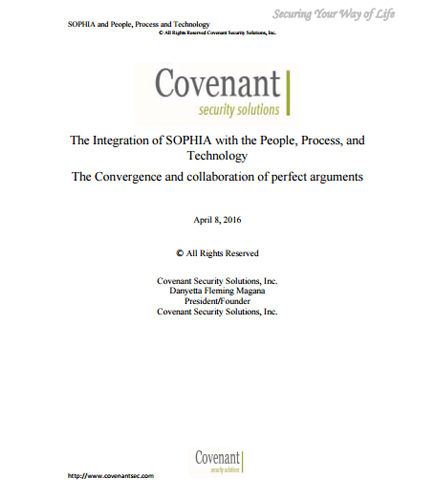 "Benefits of Security Technology Convergence with SOPHIA"
Are you reaping the full benefits of security technology convergence? Using technology alone is a practically impossible and cyber-security protection requires the convergence of physical security and cyber-security. If not, Security Operations and Intelligence Analysis tool can help you do that by securing the integrity of your business data and processes. What is the security technology convergence? How Security Operations and Intelligence Analysis tool can help your business? How and when a disruption of sensitive data may occur? How to integrate SOPHIA within the organization? How technology convergence using SOPHIA can streamline your business? This paper examines strategies to improve an organization’s overall cyber-security posture and manage risk by converging physical and cyber security by collecting real time data on the organizations people, systems, and processes using Covenant Security Solutions Security Operations and Intelligence Analysis (SOPHIA). What is cyber attack ? What is cyber security ? Cyber security is the body of technologies and process which practices protection of network, computers, data and programs from unauthorized access, cyber threats, attacks or damages. It deals with controlling physical access to hardware alongside protecting harm coming via network access and code injection. The sole purpose of cyber security is to defend the integrity of computing assets belonging to or connecting to an organization’s network. What is Cyber Ecosystem ?